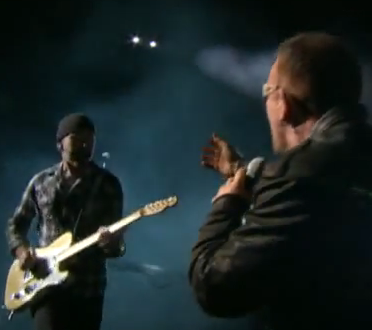 Initial reports said that hundreds of thousands of people watched YouTube’s Live U2 concert on Sunday night. Then reports yesterday raised the estimate to 2.5 million. Double that, and then double it again. 10 million is the real number of live streams that YouTube did that night, according to Variety. That’s massive, and it’s obviously the biggest live streaming event YouTube has ever done. But even more impressive is just how smoothly it went. I watched about half of the two and a half hour show, and if there were any interruptions, I didn’t see any. I didn’t even see any hiccups, it was that good. I had the show running full screen on my desktop computer, and it was pretty great picture quality for live streaming video. Though YouTube hasn’t officially commented on it, it’s widely believed that Akamai [update below], and not Google, were the ones actually handling the streaming capabilities. They’re the group that also handled it for YouTube Live, this past summer. That event saw some 700,000 concurrent views during its peak, undoubtedly, this had way more. Of course, even 10 million is nothing compared to some of the most popular television shows, but we’re starting to see audience of comprable sizes (though on a worldwide level whereas TV ratings are generally cited for the U.S.). The recorded version of the full 2 and a half hour concert is now officially being served up by YouTube and it already has over a million views in 3 days. 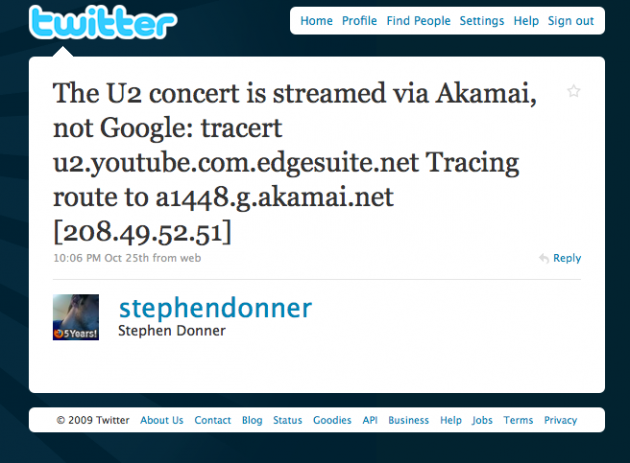 Update: As Stephen Donner points out in the comments, he was able to trace the stream as it was happening, sure enough, back to Akamai.